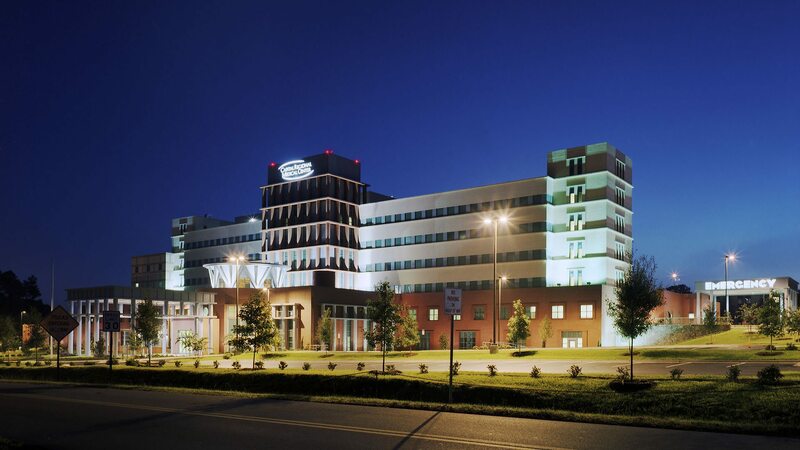 Capital Regional Medical Center approached TMP for help designing a new replacement facility for its 180-bed hospital. The new facility was constructed directly in front of the old facility, negating the requirement for a certificate of need. The site is master planned to allow for significant future growth of the hospital and a medical office building within the footprint of the old facility. Any future medical office building can be connected to the main hospital building via an underground connector that leads directly to the rotunda lobby of the main hospital building. TMP collaborated with the architectural firm of Michael Graves & Associates on the design and overall concepts. A double-height, wood-paneled rotunda that serves as the main lobby. Visitors and outpatients are able to access all major service points from this space. Circulation within the ancillary areas of the hospital is organized with major “streets” and neighborhood blocks to simplify way-finding and to increase flexibility for future change. A hand-painted mural in the nursery as well as decorative inlaid flooring and crown molding in the Labor/Delivery/Recovery and Postpartum rooms.